It is quite hard to grow-up in a place where almost everyone else has gone to die. This is usually how I respond when quizzed about my hometown. You see, I was born and raised in Worthing, a quintessentially English seaside town- an institution that despite the best efforts of Tracy Emin, continues to conjure up fond thoughts of carefree summer days, deckchairs, sandcastles, ice creams and slot machines, in all but the utterly heartless. I am not utterly heartless. It just is quite hard to grow-up in a place where almost everyone else has gone to die. And I might add, a place where those who haven’t, are passing through in search of carefree summer days, deckchairs, sandcastles, ice creams and slot machines. 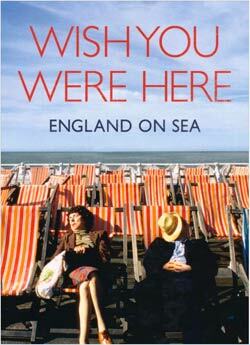 Despite being a seafaring country, the British were in fact surprising slow to take to the seaside. For centuries the beach existed as a here-be-aquatic-monsters region best avoided if possible. It was a realm from which chancing-it boat-borne rapers and pillagers and land-grabbing foreign invaders frequently emerged. The liveliest emotion it stirred in most right-thinking mortals was fear. Go to almost any coastal resort in England, and you’ll find that the oldest part is usually some way back from the shore. Such ancient streets purposely laid out to present either a spindly shoulder or a crooked back toward the ocean. Fast forward to 1951, and the sights and sounds of the seaside had become so synonymous with the nation that a whole section of the Festival of Britain was devoted to championing their delights. So just how did we go from fearing to loving the coast? And what is it about a British beach that is enough to make a great train robber like Ronnie Biggs turn himself in for the chance of a pint by the sea before he dies? Writing this book I’ve been wrestling with those questions and attempting, in a sense, to make peace with my roots. Journeying around England, I’ve been digging into the past to find reasons for their existence and allure. While meeting the kinds of people who live, work and play in them today. Like football and the railways, the seaside holiday was something we invented and then exported to rest of the world. Similarly, we’ve had to stand by as that world, blessed in certain quarters with better weather and sandier sands, left us far behind. A situation only exacerbated since cheap flights began allowing us to sample those faraway beaches for ourselves. And we left many of our own ones to rot in due course. At a moment, though, when economic conditions and substantial regeneration works are making us look more kindly upon the coasts again, Wish You Were Here considers what their story says about ourselves. For if English made the seaside, the seaside also helped to make us what we are too, inculcating notions about health, leisure and the rightful pursuit of pleasure that endure to this day.